The Virgin Mary seated with her hands raised is crowned by God the Father holding an orb, the Son, with a cross-staff and the Holy Ghost, represented in human form in the centre. Beneath the ledges on which the Father and Son are rasied there are two angels, one with a lute and another with a harp. The Virgin, wearing a gown and cloak fastened by a brooch, is seated in the centre of the panel, crowned with a triple crown surmounted by a cross, her hands raised in an attitude of prayer. The Trinity is shown as three separate similar figures, all with haloes and two of them showing bare feet. 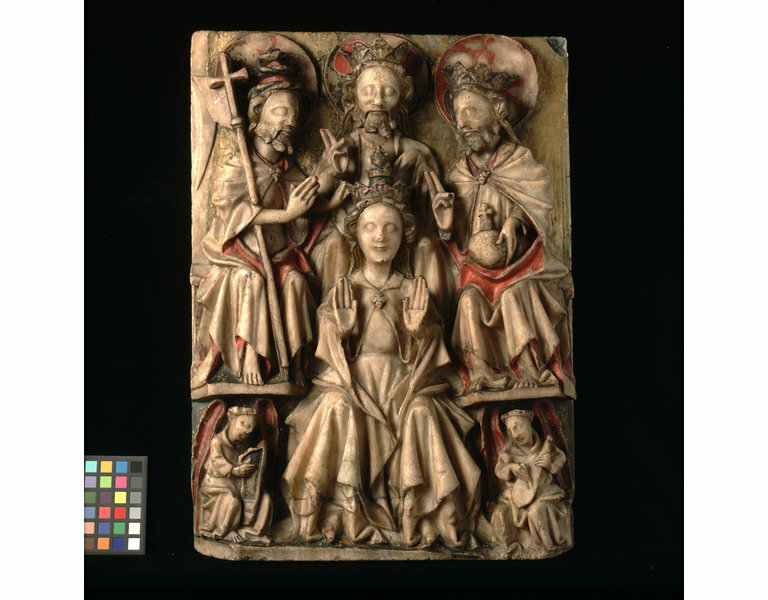 Above to the left, enthroned on a ledge and turned towards her, is God the Son, bearded, crowned with a triple torse surmounted by a cross and wearing a cloak fastened with a brooch. He touches the Virgin's crown with his left hand and presses the Resurrection cross-staff with a pennant against his body with his right arm. 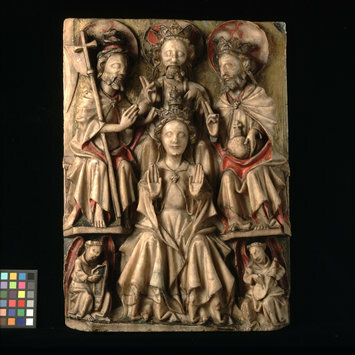 God the Father, crowned and wearing a gown and a cloak fastened with a brooch, is seated on the right of the panel. His right hand is raised in blessing, and he holds an orb surmounted with a cross on his lap with his left hand. The Holy Spirit is seated behind the Virgin, touching the crown with his left hand. Under the ledges are seated two angels, the one on the left playing a small harp. The angel on the right holds a plectrum in his right hand with which he plays a lute. The left hands of God the Son and God the Holy Spirit are carved in a very awkward manner. There is a break across the top right corner of the panel. The panel is chipped at the bottom right. Gilding remains on the hair and crowns of the figures on the upper background and on the edges of garments. There is red colour, flecked with white, on the angels' wings and red on the folds of the cloaks of the Father and the Son. The three haloes are decorated with red and black and a little white. At the bottom of the panel the ground is painted green, now darkened, and sprinkled with the usual daisy pattern. There are the remains of gesso knobs forming flower shapes on the upper background. The back of the panel bears four lead-plugged holes, three with latten wires attached. The bottom and middle of the back of the panel are scooped away. Acquired by Dr W. L. Hildburgh in Paris. Formerly in Toulouse. On loan from Dr Hildburgh since 1928. Given by Dr Hildburgh in 1946.